Horse racing has been around for as long as people and horses have worked together. The first domesticated horses weren’t ridden. Horses pulled carts and chariots. A letter penned in 1780 BC exists to King Zimri-Lin, ruler of the city-state Mari, which was located on the Euphrates River. In this correspondence, the writer discourages the king from riding a horse (a donkey was deemed okay) but advised him to use a chariot. Apparently only barbarians rode horses. 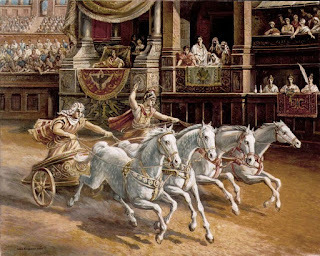 In their leisure time, the ancients raced their chariots (remember the infamous Ben Hur scene) in open areas and in Hippodromes. Homer spoke of chariot racing in his epic poem, The Iliad. The biggest arena was Circus Maximus in Rome which could host 200,000 spectators – most major cities had arenas for events. Chariot races were traditionally seven laps in length, which equates to three miles. Every culture with horses used the equines in sporting events in one manner or another. The Mongolians still race their hardy steeds in the same way their ancestors did. The Middle Eastern people tested the mettle of their horses by racing them in the sparse desert mimicking battle conditions. The legendary endurance e of the Barbs, Arabians, Turkoman, and other desert breeds became the foundation of the modern Thoroughbred racehorse. Knights would challenge one another to test their horses. In one contest during the time of King Richard I, a make-shift track just over three miles was set up. Knights rode for the prize of forty pound of gold. In 1512, Chester (England) established public races. A special day in the Chester races in 1540, Shrove Tuesday, gave a silver bell worth three shilling to the inner of the fastest distance runner. Multiple racetracks were developed during the reign of King James VI (of Scotland) & the First of England. Charles I encouraged racing and especially enjoyed attending Newmarket Racetrack, which had been holding races since 1667. But all was not well. Enter the Great Pretender...Oliver Cromwell banned racing. When Charles II took the throne, he allowed racing to start back again and pushed for a change of sprinting to middle and longer distance racing. The ‘new’ Reformation King was the first to race horses under his own name. 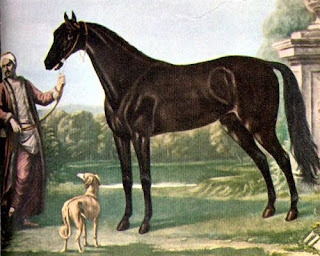 Charles established the ‘King’s Plate’ races in 1665 to highlight his breeding ideals. The pursuit of winning the King’s Plate was a large incentive to breed better racehorses. The ‘modern’ Thoroughbred racing really took place under Queen Anne. She sought imported bloodstock to improve the local British horses. 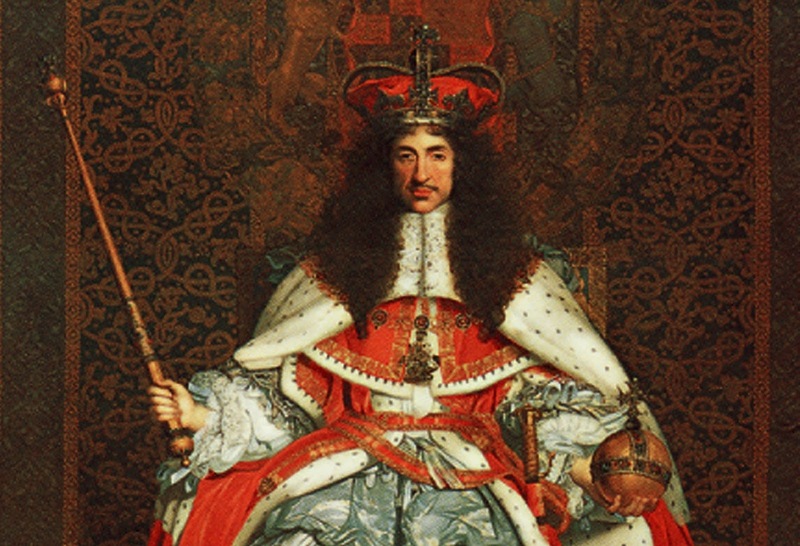 King George II passed an act to prevent inferior animals from participating. These equines included ponies and ‘weak’ stock. The Jockey Club (JC) was founded in 1750 and the Club purchased Newmarket in 1753. The famous betting & sales company, Tattersalls, arrived on the scene in 1176, funded by Richard Tattersall. Originally, the company was based in Hyde Park but it moved in 1865. Burke’s Peerage was first published in 1826. This book records the genealogy and heraldry of the British nobility. The Thoroughbred racehorse’s pedigree has a longer tradition. 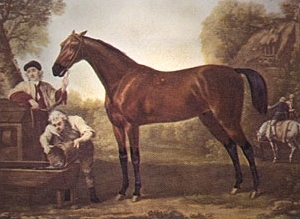 The General Stud Book, the listed collection of Thoroughbred pedigrees, was first published in 1791 by James Weatherby. The first published Stud Book was in 1808. The Stud Book included a chapter for imported “Arab, Barb, and Spanish horses and Mares’. Colonel Bruce Sanders published the American American Stud Book in 1873. Crusaders and nobility returning from the Middle East and Africa managed to sneak back ‘prized’ desert-bred stock. One of the first recorded imported Arabians to Great Britain was by Scotland’s King Malcolm I in 1121 AD. He gave the horse, along with its Turkish armor, to a church of St. Andrews. It is said that all modern Thoroughbreds descend from one of three desert stallions: The Darley Arabian, The Godolphin Arabian, and the Byerley Turk. The Darley Arabian came from Aleppo and is considered one of the most influential of the three sires. His descendants include Devonshire Flying Childers and the immortal Eclipse. 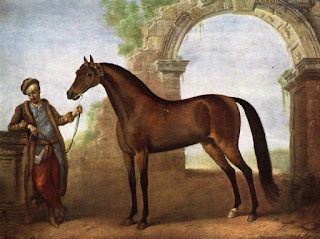 The Byerley Turk was the personal war horse of Captain Byerley in 1689 and was brought to England in 1704. The Godolphin Arabian (he probably was a Turkoman with Arabian blood) was imported around 1724. The Godolphin Arabian was subject to much speculation about his origins, supposedly at one point making an appearance at the Royal French Stables. Equine geneticists who study pedigrees have estimated that Thoroughbreds actually have roughly 31 original horses registered in the Stud Book, of which many were imported Arabians, Barbs or Turks. What other imports influenced Thoroughbred breeding? Other horses include The Old Morocco Barb (imported 1637), Place’s White Turk (imported 1657), the Dun Arabian (imported 1715), and the Bloody-Shouldered Arabian (imported 1719) – most likely a grey horse with chestnut markings on its shoulder (‘bloody marks’). Perhaps the legend of the Godolphin coming from Morocco came from the history of the Old Morocco Barb. This horse was a gift to King Charles I by the ruler of Morocco in in 1637. The imported horses were mated with local breeds. One of the predecessors or the Thoroughbred was the Irish Hobby Horse, which pre-dated the Christians. Hobbies were raced in Ireland and known for their speed since 1015 BC. Racing took place at Tara and the Curragh of Kildare. Kings Henry VIII and James I brought over Irish Hobbies to mix with the desert horses. Hobbies had prominent hip bones, responsive mouths, well-proportioned bodies, and tended to amble. The breed was very hardy. Constant in-fighting between war-chiefs led to the ultimate demise of the breed although a few remained in private studs, like Sir William Berkeley, the Royal Governor of Virginia. Those horses became the part of the foundation for many American breeds. Local English Running Horses were also used. These equines were speed specialists, much like the American Quarter horse is today. The addition of the desert blood added endurance and stamina. The foundation mares were just as important as the stallions. Old Bald Peg and Mr. Massey’s Black Barb Mare were Hobby Horses. Speed is gotten via the female line. Having the Irish Hobby Horse mares gave the Thoroughbred the speed, and the desert horses added the stamina. 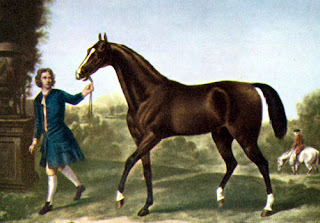 Old Bald Peg is in the pedigrees of the great racehorses Matchem (1748), King Herod (1758), and Eclipse (1764). The Old Morocco Mare is in the pedigree of the horse considered by many to be the ‘first’ real Thoroughbred, Spanker. When bred to her son Spanker, Old Peg produced the Spanker Mare, who in turn foaled the Leedes Arabian Mare. The line went on to produce (Devonshire) Flying Childers. Massey’s Black Barb Mare can be found in the pedigrees of Doncaster and Native Dancer. How many of the foundation horses were actual Arabians? In reality, very few were. True Arabians were treasured and not sold as a rule by the Bedouin tribes and rulers. Asil (purebloods) stallions were occasionally given as gifts but the mares were jealously guarded. Many countries made it a crime sell an Arabian out of the country. For Europeans, advertising a Barb or Turkoman horse may have earned the owner some decent money but change the breeding and/or name to ‘Arabian’ and suddenly the stallion (or mare) could command a higher price. Those animals that were brought over from Africa and said to be Arabian were most likely either culls or a part-breds. In 1913, Britain enacted the Jersey Act, which denied registration of any Thoroughbred born in America unless all ancestors could be traced to animals in the General Stud Book. This was a political move after a flood of American horses traveled abroad to compete when American tracks were closed. It wasn’t repealed until 1950. Since most horses bred in the USA had some non-British blood at the time, it was devastating to international racing. 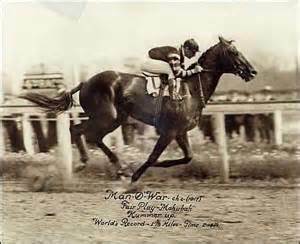 Track stars like Man O’ War were banned from racing in England due to their ‘impure’ blood. The Act also hurt British breeders by limiting a source of outcross lines. Bulle Rock was the first Thoroughbred imported to the USA. He was a son of the Darley Arabian. Other notable early Thoroughbred imports to America include Monkey, Messenger, Diomed, and Janus. Messenger founded the line of horses that eventually became the Standard bred and is found in the pedigree of Hambletonian. There are a couple of races that claim to be the oldest continuously held race. One is the Kiplincotes Derby, in South Dalton (England) ran since 1519. The Doncaster Gold Cup has been held since 1766 and the St. Leger Stakes since 1776 – both races now run at Doncaster (Gold Cup originally took place at Cantley Common until it moved to Doncaster). Although any breed can run, the Palio races have been held since the 12th century. The Travers Stakes is the oldest race in America, having first been run in 1864. The oldest race track in the US is The Fairgrounds in New Orleans (opened 1853) and Saratoga in New York is the second oldest (opened 1863). This week is the Breeder’s Cup, a two-day festival of championship races. First ran in 1984 on one day, the series has transformed to a world-wide celebration of the Thoroughbred Horse. In 2007, the event expanded to two days. Runners from across the globe complete to earn points and in some cases, a first place in a ‘Win-and-you’re-in’ race. Distaff: Bayakoa (1989, 1990), Royal Delta (2011, 2012) From 2008 to 2012, this race was known as the Ladies' Classic. Zenyatta, Distaff in 2008, Classic in 2009. Goldikova, Mile (2008, 2009, 2010).